Eliminating racial and ethnic disparities and ensuring fairness for youth of color in the justice system are critical challenges for our country at this time With the heightened discourse around policing and its impact on communities of color, many law enforcement agencies are actively seeking ways to enhance equity in policing practices, eliminate racial and ethnic disparities for youth of color, and improve relationships between law enforcement and the communities of color they serve. With support from the W.K. Kellogg Foundation, the Center for Children’s Law and Policy (CCLP) offers comprehensive training and technical assistance to support local law enforcement agencies in their pursuit of these goals. CCLP will help law enforcement leaders implement a data-driven and collaborative approach for addressing racial and ethnic disparities (RED) in arrests of youth CCLP will provide targeted technical assistance to help law enforcement leaders diagnose where disparities exist and implement evidence-based strategies that combat individual and structural bias. To view the application questions and additional information about the Initiative, click here. This solicitation is open to local city and county law enforcement agencies that are committed to engaging in a collaborative, data-driven effort to reduce racial and ethnic disparities in juvenile arrests and to promote diversion of appropriate youth out of the justice system. Efforts will help law enforcement agencies to improve fairness of juvenile arrest policies, combat implicit bias, and eliminate unnecessary arrests for youth of color, without jeopardizing public safety. Eligible applicants include: city police departments, county sheriff’s departments, tribal law enforcement agencies, and other local law enforcement entities Applicants must demonstrate significant levels of stakeholder engagement, capacity to collect and analyze data, and commitment to implementing policy and practice reforms. 1) Complete and submit the applicant questionnaire by 11:59 p.m. EST, on Wednesday, March 21, 2018. Applicant agencies should submit their application online using the following link: https://goo.gl/forms/yNPWikKfX40nfs1m2. Please contact Tiana Davis, Policy Director for Equity and Justice at the Center for Children’s Law and Policy, with any questions about the application. 2) Participate in a teleconference with the application review committee. Finalists for this project will participate in a teleconference interview with members of the application review committee. Key law enforcement leaders from your agency will be asked to participate in the teleconference, along with other juvenile justice stakeholders from your jurisdiction The designated point of contact for each finalist law enforcement agency will be notified and asked to coordinate the teleconference. If you have any questions about the project or the application process, please contact Tiana Davis at tdavis@cclp.org. Thank you for your interest in the Law Enforcement Leadership for Equity Initiative and for your efforts to reduce racial and ethnic disparities in your jurisdiction’s juvenile justice system! 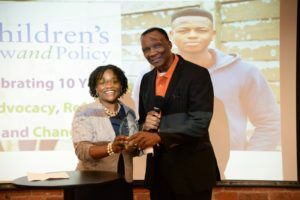 About the Center for Children’s Law and Policy The Center for Children’s Law and Policy is a public interest law and policy organization focused on reform of juvenile justice and other systems that affect troubled and at-risk children, and protection of the rights of children in those systems. CCLP is one of the leading national organizations working to reduce racial and ethnic disparities in juvenile justice. For more information, visit www.cclp.org. About the W.K. Kellogg Foundation The W.K. Kellogg Foundation (WKKF), founded in 1930 as an independent, private foundation by breakfast cereal pioneer, Will Keith Kellogg, is among the largest philanthropic foundations in the United States. Guided by the belief that all children should have an equal opportunity to thrive, WKKF works with communities to create conditions for vulnerable children so they can realize their full potential in school, work and life.